Megabuyte, July 2012. Original article here (£). 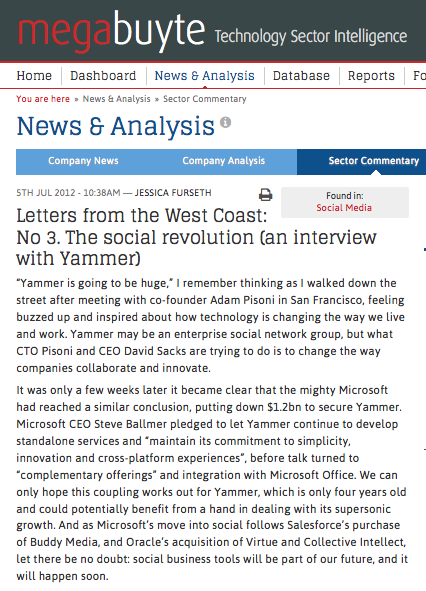 “Yammer is going to be huge,” I remember thinking as I walked down the street after meeting with co-founder Adam Pisoni in San Francisco, feeling buzzed up and inspired about how technology is changing the way we live and work. Yammer may be an enterprise social network group, but what CTO Pisoni and CEO David Sacks are trying to do is to change the way companies collaborate and innovate. It was only a few weeks later it became clear that the mighty Microsoft had reached a similar conclusion, putting down $1.2bn to secure Yammer. Microsoft CEO Steve Ballmer pledged to let Yammer continue to develop standalone services and “maintain its commitment to simplicity, innovation and cross-platform experiences”, before talk turned to “complementary offerings” and integration with Microsoft Office. We can only hope this coupling works out for Yammer, which is only four years old and could potentially benefit from a hand in dealing with its supersonic growth. And as Microsoft’s move into social follows Salesforce’s buying of Buddy Media, and Oracle’s buying of Virtue and Collective Intellect, let there be no doubt: social business tools will be part of our future, and it will happen soon. The day I met with Adam Pisoni, however, there was not so much as a whisper around to reveal what was in the works. If Pisoni knew, he certainly gave nothing away. Yammer has been doing pretty well on its own though: over 5m corporate users on a freemium model, including employees at 85% of the Fortune 500, of which 20% are paying customers. This percentage is double that of the industry average, as estimated by Constellation Research. Yammer’s revenues have not been disclosed, but speculation puts it between $22-30m. So how did Yammer manage to get so far so quickly? Yammer’s software is designed to enable this new culture of creation to unfold on a practical level. The key elements to empower employees and decentralise execution, says Pisoni, as well as to operate on a transparent model where everyone can see what others are doing and build on it. This lets people connect and organise themselves in the optimal way, pushing past the boundaries of communication and job descriptions. “Yammer is all about self-organisation and empowerment but also transparency and trust, and you need both of those things to be successful,” says Pisoni. Better informed employees make better decisions, and in turn make the company more adaptable and innovative. As a former office worker, this sounds downright wonderful. But, I put to Pisoni, middle management is going to hate this. This is such a significant shift in thinking that it that may even require a generation shift to come to fruition. “People ask us, who is your target customer? But is not a geography, it is not an industry, it is not a size. It is companies that recognise that they have to make this shift. [Our demographics are] an even slice across industry, geography, and size, but the consistency is that they are using Yammer to transform into a new kind of company.” While some people get it right away, Pisoni acknowledges that the novel nature of Yammer’s offerings mean lots of conversations with customers to help them see how they can take these ideas and use them in a practical way in their companies. “There are not really any good roadmaps. Plus to become a transparent company is difficult and there is friction involved,” says Pisoni. Explaining how this can be done, and why it is beneficial, is a big part of Yammer’s challenge. ‘Facebook for business’ tends to be the shortest way to explain what it is Yammer does, and it has played a significant part in helping people understand the basics of Yammer’s operations. But considering Pisoni’s face when I bring this up, these reference points are starting to feel limiting. “The comparison was somewhat useful in the beginning, but yes, now we find a little bit annoying.” Pisoni laughs. “Really early on, we started Yammer because we recognised where this new form of [self-organising meta-to-meta] communication was going. It was revolutionising how we communicate in our personal lives [through social media], and this was likely to go to enterprise,” says Pisoni, emphasising that Yammer was the first to come out and state their intention to become a social enterprise. The manifestation of this, however, looks very different from Facebook. In the business context, the focus is on people self-organising into groups, getting work done as teams, and integrating with applications and business processes. Yammer’s interface also distinguishes between content generated by people and applications, a factor which Pisoni highlights as an advantage over Chatter and Tibbr: “You do not want the human generated content be pushed down [the information stream] by a mass volume of computer generated content such as printers out of ink. Over time we will let people interact with [computer-generated] stories: they can comment on them, or ‘like’ them, and that will move them over into the human-generated content feed as it has been signalled that people care about it.” What Yammer is doing now is developing its cross-application workflow systems, meaning data will flow together whether it is from SharePoint, Salesforce, NetSuite or elsewhere. As data volumes grow, the human interaction with the content will be crucial to determine its importance, hence helping the system keep noise at a manageable level for the individual users. Business evolution is no longer a seminar that is held once a year: it is becoming a way of life. Pisoni is proud that Yammer practices what it preaches: a decentralised organisation where innovation happens at the edges. Staff who feel empowered make for better workers, and the role of management is shifted from telling everyone what to do, to organising people so they can interact and create in an efficient manner. This approach is different from what came before and can feel a bit fuzzy and difficult to quantify, but this is what happens in a social space. What Facebook, Twitter, Tumblr and all the other social networks have done is to take something people do naturally offline and move it online, and the likes of Yammer are picking up the elements that can improve business relationships. A new entrant on on the social technology scene is Pinterest, which was founded three years ago in Palo Alto by Ben Silberman and Evan Sharp. Now with over 10m users, Pinterest lets users create ‘pinboards’ of images and share them, like themed scrapbooks: “The things you collect says so much about who you are and what you are interest in. That is what I wanted to capture with Pinterest,” said CEO Ben Silberman at March’s SXSW gathering in Texas. “I cannot say the idea came from hard-nosed business analysis. It was just something I really wanted to see built,” said Silberman, who admits the company is still experimenting with revenue models. So far affiliate links seems to be the main method. The differentiation is often a sleek interface and beautiful design, as efficiency is no longer enough and we need a little something extra to be charmed. Pisoni talks about the joy of creating a product that makes people’s workday better; Silberman kept saying how satisfying it is to create a beautiful site where people can share things that make them happy; Zuckerberg wants to change the world, plain and simple. The new social layer means technology is no longer just about creating something that works and making some cash, but to make things better, more beautiful, more meaningful. Now that the human element has been mixed into technology there is no turning back. Posted on 07/06/2012 by Jess. This entry was posted in Business features, Technology features. Bookmark the permalink.